Home News 5 More Movies Filmed in Astoria! 5 More Movies Filmed in Astoria! When we first wrote about five of our favorite movies filmed in Astoria, nearly 150 of you liked and shared our post! We learned about so many more movies that were filmed in our neighborhood, and we got to work on our research. And by research we mean watching too many movies in one sitting and eating far too much popcorn. So, here’s five more of YOUR picks that we watched and loved! Christine G. told us about Queens Logic, a movie about a group of friends that meet back up in their hometown of Queens, decades after they all seperated. The group come together to celebrate the wedding of their friends’ Ray and Patricia’s wedding. What follows is a wild weekend full of ups and downs – and facing problems in a new, mature way. While the movie is a comedy, there’s a lot of lessons to be learned, and while it’s not the best movie around, it’s fun to watch a group of friends that grew up in Queens, much like many of us. Reader Rita A. sent us this trailer where you can catch a tour of Astoria! Leslie Q. sent in her suggestion of The Heat, and caught Astoria in it! “You can catch a quick glance of 30th Ave. It shows the Astoria Bank that’s across the street from Athens Park. It’s just a quick shot, you might miss it if you blink but nonetheless I think it’s worth mentioning!” So we checked it out, and she’s right! It’s super quick, but we felt a little burst of pride anyway! The Heat is actually really hilarious. It features Sandra Bullock and Melissa McCarthy, who play an ambitious good cop, and a hilarious, loud mouthed Boston cop. The two go on an adventure to uncover an elusive drug lord, and what follows is nothing short of hysterical. Reader Linda C. sent us in this cool memory: “The Hunger was filmed on Hoyt Ave and 29th St, 30yrs ago. I was standing next to David Bowie, Susan Sarandon, and Katherine Donerve.” Can you imagine standing next to such famous stars!? It seems Astoria has always been a great place to spot celebrities. The Hunger, which is actually a British film, is a horror story that tells about the vampiress Miriam, and her vampire lover John. They find unsuspecting club-goers in New York City, and feast upon their blood to stay young. The movie takes a twist when her lover, who she promised eternal life to, begins to rapidly age. He now needs to find a way to reverse the effects, and what follows is a whirlwind of vampire drama. It’s like Twilight from the 80’s – with equal amounts of vampire angst. Kiss of Death is one of the oldest movies on our list, but it was seriously one of the best we watched! Reader Mary F. sent in this tidit: “The most famous scene from “Kiss of Death” was filmed around the corner from where I lived. That’s the house on 14th Street not far from the bridge. 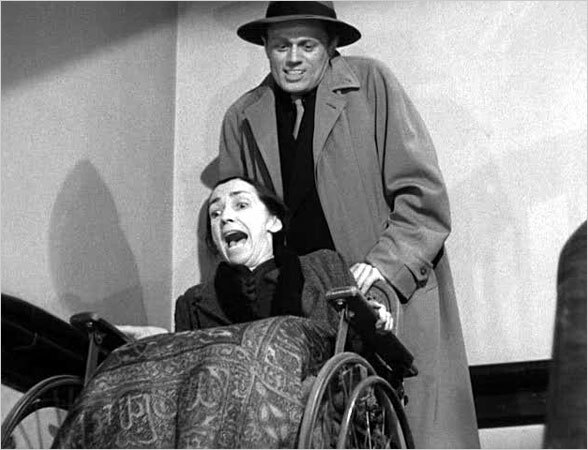 The scene where the gangster pushes the wheelchair bound woman down the stairs was filmed there.” It was awesome watching the movie after learning this fact, and imagining what Astoria must have looked like way back in the late 40’s when the movie was made. Kiss of Death is about Nick Bianco, an ex-con who finds himself in jail after a robbery gone wrong. To get out of jail and return to his family, Nick agrees to give up his cohorts – but it’s not as easy as it seems. So, we had reader Joe S. say, “How could you not have KING KONG on the list? Filmed right at the train tracks on 31st st. and 23rd ave!” and we have to admit, he was totally right. We have no idea how we missed it! Mary F. also recalled the filming of King Kong, “The 1970s remake of “King Kong” also took place in Astoria and I was there for the filming. They put a mock up of the subway train on the sidewalk near Ditmars station to look like Kong threw it there.” What an awesome shot! Now, do we really need to tell you what King Kong is about? There’s a big gorilla. And he comes to New York. And does gorilla things. It’s a great movie – not our favorite remake – but you can never go wrong with a classic. So, there it is! Five more of our favorites. We always get such a kick out of watching these movies and catching a glimpse of Astoria – whether it’s present day Astoria, or decades ago Astoria. Thanks for all your suggestions! Previous articleFree Kayaking in Queens!